For many companies, the cloud’s economies of scale, flexibility and predictable payment structures are becoming too attractive to ignore. Looking to avoid costly capital outlays for new servers and the high overhead of managing on-premises architecture, many companies have started moving to the cloud as a cost effective option to develop, deploy and manage their IT portfolio. To be sure, the benefits of cloud computing go well beyond economies of scale and efficiency. Consider that the vast number of servers that help to drive down costs are also on tap to provide virtually inexhaustible levels of compute power, which can redefine the possibilities for virtually every aspect of your business. But regardless of a company’s size, migrating to the cloud is certainly no small task. When done right, the process will cause a company to reconsider its culture, its processes, individual roles and governance—not to mention engineering. Download the free Enterprise Cloud Strategy e-book for a road map to navigate your way. For the past several years, Barry Briggs and I have been on the front lines in helping companies, including Microsoft, navigate these challenges of migrating to the cloud. We’ve seen firsthand how companies are using the cloud’s potential to transform and reinvent themselves. For example, the sales team for Minneapolis-based 3M Parking Systems needed better insight into thousands of new technology installations of which the company had recently taken ownership following its acquisition of parking, tolling, and automatic license plate reader businesses. In just two days’ time, 3M created a tracking solution that connects multiple types of mobile devices, thousands of machines and data sources, and a cloud platform (using Xamarin Studio, Visual Studio and Azure Mobile Services). Now the 3M sales team can immediately see where equipment is installed, allowing them to work more autonomously and productively while out in the field. Another example is work done with a London-based financial services firm, Aviva, that wanted to create a first of its kind pricing model that would provide a personalized prices, reducing insurance premiums for appropriate customers. Historically, this would have required installing black boxes in vehicles to collect and transmit telemetry data back to the company’s data center, which also would have required increased storage and compute capacity. A solution like this would not have penciled out, but with the help of a handful of Microsoft tools and technologies, Aviva was able to design, develop and release the Aviva Drive app in just over a year’s time. The result was a pricing model that gave customers as much as a 20 percent discount on their premiums, and provided Aviva with a significant competitive advantage. What 3M and Aviva (and many others) have since discovered is the shifting balance between maintenance and innovation: The automation of many day-to-day responsibilities, made possible by the technologies underpinning their cloud computing platform, has freed up IT to devote more time toward creating and administering applications and services that will move the bar for the business. Based on these findings, and those of many colleagues, Barry and I have written this e-book, Enterprise Cloud Strategy. What you’ll find is an in-depth guide to help you start your own migration, providing practical suggestions for getting started experimenting, assembling a team to drive the process and how to make the most of game-changing technologies such as advanced analytics and machine learning. 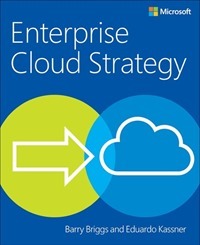 Read James Staten’s Azure blog post on how the Enterprise Cloud Strategy e-book can help you prioritize for a successful hybrid cloud strategy. Join me on Wednesday, May 11 at 10:00 am PST for the Roadmap to Build your Enterprise Cloud Strategy webinar.